For Royals fans, this is not 2009. No, that was a debacle of historical proportions with an old, dull, uninspired lineup, broken up only every five days with a ray of sunshine in the form of a Zack Greinke start. This year, the team has plenty of bright spots, with the first wave of talented young players already in the majors (Crow! Hosmer! Moustakas!) They might not pan out, in fact their each dealing with some form of the normal rookie struggles, but their mere potential makes this a far more enjoyable team to watch than the 2009 version that slogged to 97 losses. All that being said, it's beginning to look a lot like 2009 in terms of wins and losses. In 2009, the Royals started 18-11, were in first place, and looked like a competitive team. Then, they simply went into one of the great prolonged slumps a big league baseball team has ever had. They got bad in a hurry, losing 22 of 28 games between May 8 and June 9. From May 8 through August 5, 78 games, the Royals went 23-55 (.295). To put it another way, they played at the rate of a 48-114 team for almost half of an entire season. From May 8 through September 6, 107 games, the Royals went 33-74 (.308). To put it another way, they played at the rate of a 50-112 team for right about two-thirds of a season. And remember, that was with the Cy Young-winning pitcher starting for them every fifth game. Astounding. They lost 10 straight in July. They were pretty much awful at every aspect of the game, prompting Joe Posnanski, an authority on bad Royals teams, to call the 2009 edition the worst Royals team he'd ever seen. Naturally, and keeping with the bitterly disappointing nature of that season, the Royals somehow heated up in September, playing their way "up" to the fourth pick in a draft that pretty much everyone said had three players that were clearly the best. Now, this year. The Royals started 10-4, prompting me to go on and on about how they were more competitive. Nope, still not yet. Maybe they do certain things better, but they still have the worst record in the AL (second-worst overall). They have gone 21-41 (.339) since then, well worst than a 100-loss pace for this ample chunk of the season (38 percent). Also, after an inspiring series win in New York in May, the Royals have outdone themselves, going 11-28 (.282). That batting-average win percentage, accumulated over about a fourth of a season, would be a 46-116 record if played for an entire season. Even as the Royals hot offensive starts pretty much all cool off, the issue is pitching, and it points to a large, more relevant, more frightening problem: the organization's best pitching prospects are struggling, almost across the board. Now hopefully they'll get on track (the league that the Royals' AA team plays in is offense-heavy), but it's clear the above losing trends will continue without some starting pitching. Good starters turn things around. They bust losing streaks. This Royals pitching staff has no streak-busters. Maybe Danny Duffy will be one some day, but today is certainly not that day. So, I'll of course focus on the rookies and prospects as I watch, actually real prospects with real potential this go around. But after KC kicked away a game Friday night that the Cubs were earnestly trying to kick away on the basepaths, I'll put no limits on how many games this team will lose. Friday's loss was the team's sixth in a row, and they have way more road games left than home games. For now, never say the Royals won't lose 100 games until they pick up win No. 63. The most compelling figure at the U.S. Open does everything righthanded except one thing, and yet they call him Lefty. That’s because Phil Mickelson’s one wrong-handed activity is swinging a golf club, and he does it pretty well. (He learned to swing mirroring his dad; thus the lefthanded approach.) With Tiger Woods missing the U.S. Open, which starts Thursday at the Congressional Country Club in Maryland, the spotlight is squarely on Phil, who has finished second at the U.S. Open five times, more than any other golfer. He has never won the U.S. Open. It’s the tournament that he says he’s dreamed about winning since he was a little boy, and yet he’s lost it so many times in excruciating fashion. We’ll get to that in a bit. Mickelson has so often been the swashbuckling risk taker, trying ridiculous shots that many couldn’t even visualize. Rick Reilly once wrote that watching Phil was like watching a drunk chase a balloon near a cliff. His shots were spectacular, but the meltdowns were somehow more spectacular, more defining, more indelible. It was like watching NASCAR for the crashes. Phil finally broke through and won the 2006 Masters, shedding forever that weighty label of “Best Player Never To Win A Major.” His back nine was one of the best ever on a Sunday at Augusta, second only to Jack Nicklaus’ mythical charge in 1986, according to Sports Illustrated. He won the Masters two other times, won a PGA Championship, but has so far not been able to break through in that most American of tournaments, the U.S. Open. Phil was locked in a duel with Stewart, who died four months later in a plane crash, a reminder of what a truly tragic figure is. Phil took a one-stroke lead to the par-4 16th, but then bogeyed that hole. Stewart buried a 25-footer for par to tie it. The par-3 17th was a thrill, with both golfers sticking their tee shots within 10 feet of the cup. Phil missed his eight-footer, Stewart made his three-footer for a one-stroke lead. Stewart then buried a 15-foot par putt on 18 to seal the win. His fist out, back leg up victory pose is a statue now. This was back when Tiger was throttling the golf world, with this win, Tiger had won six out of nine majors. But Phil birdied the par-5 13th on Sunday to get within two of Tiger. But a bogey on 16 did him in, and Tiger cruised despite bogeying two of the last three holes. After Phil birdied the par-4 16th to take the lead with two holes to go, another par-3 17th did him in. His tee shot went into a bunker. His shot out of the sand stayed eight feet above the hole. His par bid missed the cup and just kept rolling, six feet past. He missed the comebacker. The double-bogey ended his bid to finally win the U.S. Open. Oh, Phil at Winged Foot. This one was an absolute nightmare, the worst meltdown of them all for Phil. He went to the 18th and final hole needed a par 4 to win, bogey for a playoff. He had scrambled all day, hitting a mere two fairways all day, but he was still in great shape. With thousands of fans silently screaming “No!” Phil hit driver off the tee, driving his shot off a hospitality tent. He then tried to cut a three-iron around a tree (another of his bold, creative shot ideas) but it bounced off the tree’s trunk and rolled back at him. His third shot went into a bunker. From an awful bunker lie, Phil’s chip trickled off of the green. His chip for bogey and a playoff didn’t come close. Afterward, a befuddled, red-eyed Phil gave this classic quote: “I can’t believe I just did that. I am such an idiot. 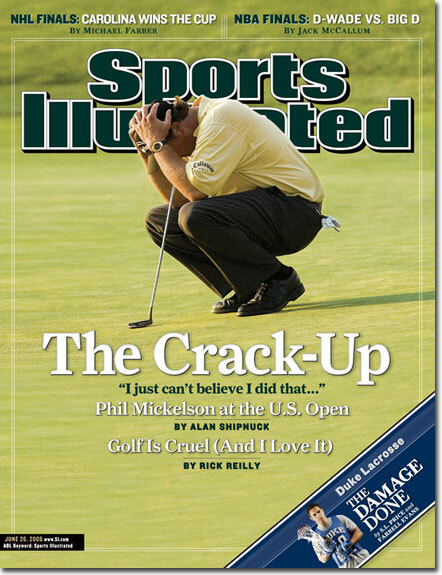 I can’t believe I couldn’t par the last hole.” He was on the cover of Sports Illustrated that week, crouched in agony (see above). Phil has had his share of narrow losses, but this was easily the most awful. “I’ve never seen him like this,” his wife, Amy, said in a hushed tone afterward. Playing on a Monday after rain pushed back the tournament’s conclusion, Phil birdied 12 and eagled 13 to grab the lead. However, a three-putt bogey on 15 hurt his cause. Then another par-3 17th cropped up, which Phil bogeyed. This, coupled with Glover’s only birdie of the day on 16, sealed the deal. I’ve never especially rooted for Phil to win, but this week, I think I want him to win the U.S. Open. I’ve enjoyed the theater of how many times he’s come so close, but I just like to see athletes break through, especially late in their careers after coming up just short so many times. Phil seems like a good guy. He actually smiles on the golf course, like a man getting paid (a lot) to play golf should. He seems to have his priorities in order. He left the tour for a while when his wife, Amy, had breast cancer. He took a five-week “paternity leave” to enjoy the birth of his daughter Sophia. He was derided somewhat by his tour peers (“Did Phil have the baby?”), but Mickelson knew even then that spending time with your newborn daughter just might be more important than playing in the Buick Challenge in October. Phil’s already wealthy, and he seems to have a great, fulfilling family life. But professional athletes play to win. The competitor in him, the kid in him, desperately want to win his beloved U.S. Open. He turns 41 on Thursday, the day of the tournament’s first round. Time is no longer on his side. I’m hoping he does well. He’ll almost surely have thunderous support. But should he be at or near the lead in the final round on Sunday, I’ll be… well, I’ll be expecting great theater.